Anaerobic Digestion – what is it? It is used as part of the process to treat biodegradable waste and sewage sludge. As part of an integrated waste management system, anaerobic digestion reduces the emission of landfill gas into the atmosphere. Anaerobic digesters can also be fed with purpose-grown energy crops, such as maize. The process produces a biogas, consisting of methane, carbon dioxide and traces of other ‘contaminant’ gases. 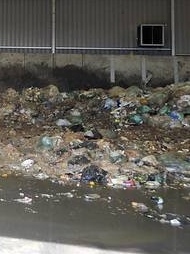 “the treatment of biodegradable waste has an inherently high potential for offensive odour and in our experience it is difficult to prevent odour emissions at all times even when the operator has taken all the appropriate measures.” The Environment Agency. Anaerobic digesters are an excellent way of processing organic waste which provide energy and a product which can enhance soil fertility. However, growing crops to feed digesters rather than people is morally and ecologically wrong. For instance, maize is grown using nitrogen fertilisers, which have high energy requirements for their manufacture and consequent CO2 and N2O emissions. The food which has gone into the digester has to be replaced by imported food – involving extra energy and CO2 – thus depriving hungry people of food. This is not good for farming’s PR. Some extra plants are run on waste food. Waste food? Why is there so much waste food? Presumably because it is so cheap it is not valued. This is morally unsustainable. It might be profitable for a few, but many suffer hunger as a result. Bioaerosols are microscopic, airborne particles including bacteria, fungal spores, protozoa and organic constituents of microbial and fungal origin. They can penetrate into the lungs, causing respiratory inflammatin, coughs and fever exacerbating respiratory diseases and have been known to cause gastro-intestinal illness, eye irritation and Dermatitis. – just the unavoidable consequences that a large centralised processing power plant would have brought to homes in this green corner of Cheshire. Industrial scale power plants using food waste to produce methane and power are usually only permitted on industrial estates near major road links avoiding effects on neighbourhoods. Emissions, smells, traffic. Cres Biogas were aiming to import a massive 47,000 tonnes of rotting food waste, slurry, poultry manure, and purposely grown maize, waste beer and milk. Each of the ex MoD tanks would have a working volume of 4,700,000 (4.7 million) litres. BUT this Cres Biogas application is in the middle of a residential area, right beside homes, using unsuitable, winding country lanes and a narrow bridge, less than half a mile from Goostrey Infant School. Let your local Parish Council know your concerns and object to Cheshire East Council, see our How to Object page above for email addresses and standard objection letter. “Hiding the traffic generated by AD however, is more difficult…many projects are still turned down at the planning stage due to public concerns over the sight, smell and noise associated with AD“……..Dr. Matthew Aylott, Science and Technology Writer for the NNFCC, the UK’s National Centre for Biorenewable Energy, Fuels and Materials. The AHVLA (Animal Health Veterinary Laboratories Agency) warns farmers not to use anaerobic digestion residues (digestates) as bedding materials for livestock. It points out that to control the spread of notifiable animal diseases, this practice of using digestates and compost produced at plants approved under the Animal By-Products Regulations is not allowed under legislation. The agency adds that keepers should also be aware that livestock must not be allowed access to land on which composts and digestates from approved plants have been applied, and that crops from such land must not be used to feed livestock for 21 days following application (or two months in the case of pigs). The AHVLA says it takes all breaches of this waiting period requirement in the regulations very seriously and may restrict the movement of livestock that have had access to such land. Local authorities will also be informed for possible further enforcement actions. The Environment Agency have confirmed that the warning applies to digestate from AD plants receiving ABPs, and that it would be the AHVLA who would inspect and police it in regard to animal by-products (in this case Category 3) involved. The EA also confirm that digestate cannot be spread onto a field without that field being tested for suitability and a deployment issued by the Agency. The Official Information Portal on Anaerobic Digestion, Biogas-info website, also states that all AD plants intending to use animal by-products must apply to the Animal Health Office for approval. The Defra website for the AHVLA states: Animal by-products (ABPs) include meat, fish, milk and eggs when they are not intended for human consumption, and other products of animal origin including blood, hides, feathers, wool, bones, horns and hoofs. Biffa’s flagship AD plant near Cannock has been causing on-going problems to residents (800m away) with a vile stench that Biffa have found difficult to stop over 18 months later. The EA have been monitoring the situation and are hoping to keep smells to a minimum in future. 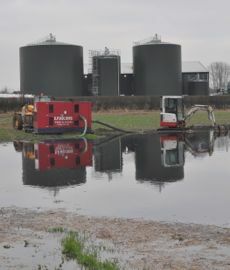 The EA are still investigating the cause of the major leak at Harper Adams University AD facility where tonnes of digestate leaked out of one of the tanks and flooded through the surrounding bund. The plant requires quite a lot of maintenance; in particular we have experienced mechanical problems with the combined heat and power unit. This was mainly as a result of impurities in the biogas having come from slurry digestion. As with any new technology there is also a steep learning curve and it has taken us about two years to learn how to manage the plant and run it efficiently. What do fellow farmers think? ….. cost, scale and complexity of the technology are still overarching worries. I’ll be returning to read more, thanks for the info! very good. with your explanation, now we have a better understanding about it. I wanna thank you for publicing this good information. Keep up the great job. I’ll subscribe to your weblog also. thnx! good encouraging comment, keep it up. Keep up the fantastic work, I read this site and I conceive that your website is real interesting and contains lots of good information. Lets go back to dumping or organic waste back in landfill sites and forget about it, it will be a problem for our kids to sort out, give them something to do, or maybe they can pass it on too. Who gives a dam, we will all be gone by then anyway. I like the fact that we will have a warmer climate, will save on heating bills. We can go swimming in our warm chemically polluted rivers in the winter months. We can all have open fires in our homes, and burn waste plastics, lots of heat off plastic when it burns, and the black smoke off it will add to the fantastic sunset landscapes with all the colors of the rainbow from all them toxic wastes we will pump into the atmosphere. Mmmmm good stuff.